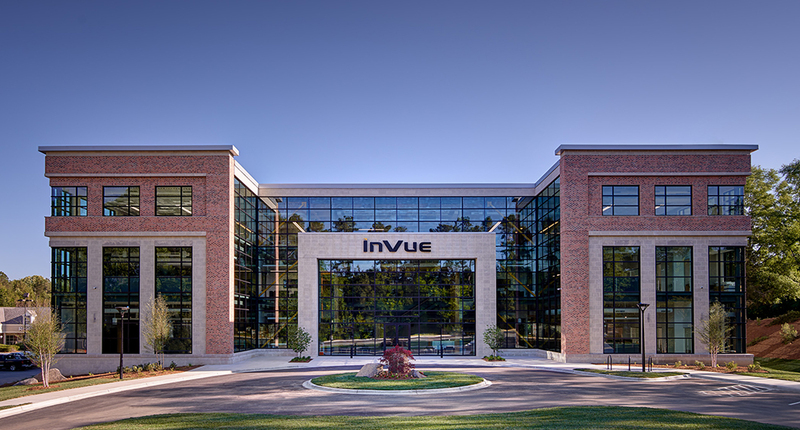 Invue New Corporate Headquarters in Charlotte, NC. New corporate headquarters in Charlotte, NC. An investment in, and commitment to, the future. This new building is a milestone for InVue, a clear tribute to our past, a commitment to our future and a symbol of the unrelenting pursuit of innovation that differentiates InVue. Just as InVue uses great design to help distinguish and elevate our products, so our new building reflects who we are, what we value and why it matters. The building design captures the essence of the InVue brand. It speaks the same visual brand language: clean, elegant, confident, where every touch point matters. Our new headquarters features the most sophisticated quality testing facility in the industry, expanded innovation, design and engineering departments along with a complete customer showroom. All designed to allow the InVue team to provide the products that will help increase profits for our customers.